This vehicle has entered service at Washington Depot on the new ?Connections4? 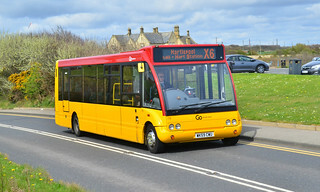 service 4 (Houghton-le-Spring - Heworth). 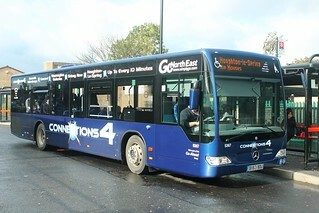 Ahead of its entry into service, this vehicle has gained ?Connections4? branding, with sub-branding for service 4 (Heworth - Houghton-le-Spring). ?Connections4? is the new brand name for service 4, which directly replaces the ?MetroLINK? brand name for service M1, with no changes to the existing route or timetable. It promotes the connections available on the service ?for? Heworth Interchange, Concord, Washington Galleries, Shiney Row and Houghton-le-Spring. 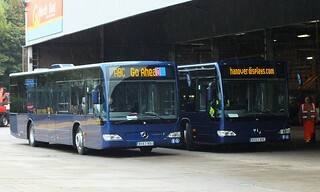 This vehicle, which carries a midnight blue base livery, has arrived into the Go North East fleet. It is currently being prepared for service at Saltmeadows Road Depot. Representing an investment of approximately &pound;2,000,000, Go North East has ordered a batch of eleven Euro 5 Mercedes Citaro heavy-weight single-deckers to be launched on ?MetroLINK? service M1 at Washington Depot. 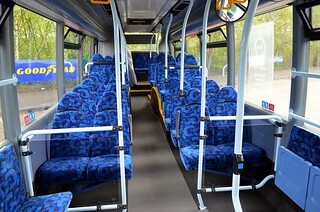 These brand new buses feature high-backed seating, free on-board passenger Wi-Fi, and ?Next Stop? audio-visual announcements.